Michelangelo Last Judgement. 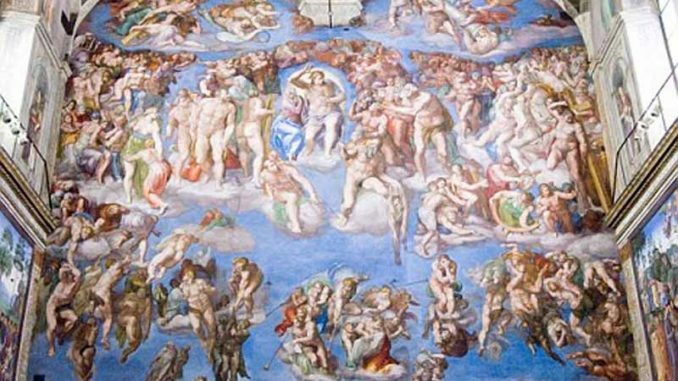 Historian and researcher Elena Lazzarini, of Pisa University, has said that the fresco, was most likely inspired by Michelangelo’s visits to the gay saunas and brothels of Rome in the early 1500’s. 500 years ago Rome had several gay saunas, which were also popular 2,000 years ago during the time of the ancient Romans. Michelangelo never married, yet had a very close relationship with a man in his twenties, when her was in his fifties. There are about 300 love poems from Michelangelo to this younger man.